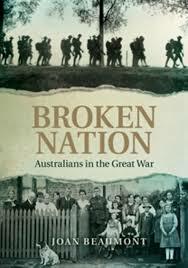 If you read only one book about Australia’s experience of World War I, as the deluge of commemorative publications marking the outbreak of the war becomes a veritable tsunami, make it Broken Nation, an account that joins the history of the war to the home front, and that details the barbarism of the battlefields as well as the desolation, despair, and bitter divisions that devastated the communities left behind. I agree with Lake’s recommendation; I admire the book for its breadth but…oh, it was relentless reading. It achieves this completely. The book is structured into six very long chapters, one for each year of the war. Within these chapters, Beaumont moves chronologically month by month, crossing back and forth between battle, homefront, diplomacy. Even within these themes, she shuttles between battle as strategy and battle as lived experience by the men who were there; homefront in a political sense, homefront in a social sense; domestic politics and diplomatic politics on an international stage. But for me, the battle scenes dominated and they dragged, particularly during the longest chapter ‘1917: The worst year’. It took me some time to get into the mindset where a death and an injury were both counted as a ‘casualty’ without distinguishing between the two, because the effect of both was the loss of a soldier who could fight then and there. I found myself inwardly groaning as I turned page after page to see yet another map with arrows showing lines of attack. There’s 36 maps in the book as a whole, (16 of them in the 1917 chapter) spread across battlefields at Gallipoli, the Western front and the Middle East, reinforcing the inexorable to-ing and fro-ing year after year. The battle scenes are interspersed with diaries and letters from the men, and visceral descriptions of sights, sounds and smells, but for me they were deadened by the weight of strategy and the stilted, chest-puffing language of military commendations. Charles Bean has a lot to answer for. But she also moves away from the noise and shouting to consider the process by which these sites have been memorialized. She notes that many of the battles that the soldiers at the time chose to have memorialized through statues are not the ones that are uppermost in national memory today. For example, the 5th division, when asked in 1919 where it wanted the memorial celebrating its wartime achievements to be located chose not Fromelles, but Polygon Wood. Our emphasis on Fromelles springs from the 1990s and the combined interventions of Prime Minister John Howard’s overseas war-memorial construction scheme and the archaeological persistence of retired schoolteacher Lambis Englezos. This is true of many of the battles: what we have been moulded to memorialize, is not necessarily what the soldiers themselves wanted to remember and honour. Even though the military sections weighed heavily with me, she does interweave it with the homefront and the broader diplomatic scene. Her analysis of the homefront includes the political wranglings with Billy Hughes and conscription, and the effects on the economy and political life of the crackdown on unions and the War Precautions Act. I’ve imbued the Labor Party lore of Billy Hughes ‘the rat’ but I hadn’t realized how much I dislike him on the broader international stage as well. I enjoyed the final 1919 chapter very much, and its emphasis on the diplomatic tradeoffs at the end of the war. Quite apart from the experience of reading the book, which I found draining, Beaumont makes some important points to counterbalance the type of history that is warping our present day politics and being pushed so insistently in this year of commemoration as demonstrated in Henry Reynold’s recent excellent article Militarization Marches On. She is at pains to point out that in many of the battles that we have appropriated to our national memory, Australians were not the only troops there. We were part of the ‘colonial’ forces, for Britain to do with as she pleased, without consultation. The book started with a prologue that spoke of Beaumont’s own great-uncle, Joe Russell. He reappears once or twice during the book. Other individuals pop up from time to time- Archie Barwick, Pompey Elliot- familiar names from the recent documentary The War That Changed Us. I must confess that I preferred the grounded, person-based approach in the television documentary to Beaumont’s soaring birds-eye history. But the reality is that we probably need both. And in this book, the birds-eye history is in very good, sure hands indeed. 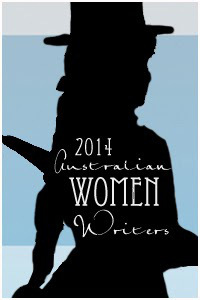 This entry was posted in ANZAC, Australian history, Book reviews. Bookmark the permalink. I agree with your assessment for readers who do not have a particular interest in war history. If you don’t like war history you won’t like this book. However, it is the best overall perspective of Australia’s role in WWI and the best introduction to that history for anyone who is interested in war history. Beaumont gives measured assessments and does not glorify the war. Perhaps a book about war that the reader has to trudge through and that fails to inspire the reader, reflects the soul-draining spirit of the period? Far better this than the hero-worshiping, entertainment-driven war histories that fuel war-hungry societies. Unfortunately Broken Nation will not displace those books in book shops. I agree with you about the ‘soul-draining’ nature of the reading experience. Especially in the 1917 chapter, which she identifies as the worst year. I find those hero-worshipping books REALLY hard to stomach. The language is just dead. I almost come out in an allergic reaction when I see the word ‘hero’ now. I think it is totally disrespectful to the person described as a hero because the word strips them of the richness of their humanity. A person who is only composed of ‘heroic’ acts is a cardboard cutout that lacks meaning. … which leads me to wonder if this is something that Richard Flanagan explores in his book, The Narrow Road to the Deep North? Have you read it Janine? No I haven’t (yet!) I was delighted that he won. I’ve read several of his books and I think that Gould’s Book of Fish is absolutely wonderful.